The Colette Meringue Skirt pattern is definitely appropriate for beginning sewers. 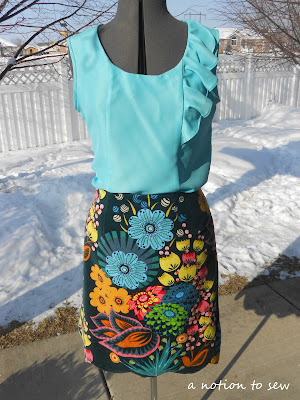 It is a basic, straight forward skirt pattern with only two main pattern pieces (front & back) and a few facing pieces. If you are opposed to waist facings (and most other facings) as I am, then you could eliminate the waist facing by inserting a lining. I did not choose to line my skirt because, well, let's face it - I got lazy and didn't feel like the extra step! A hidden side zip is used for the closure. The scallop hem is the eye catching design element in this pattern. But I won't kid you, it was a pain in the rear to trim, clip, and press those scallops. Just be patient and it is worth the effort. The sleeveless top is Simplicity 1806. 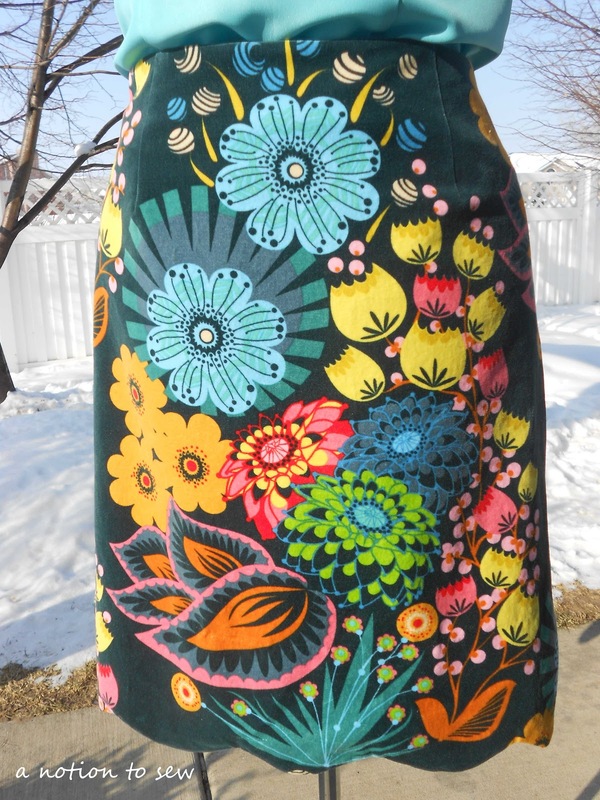 Last week, I posted my hesitancy about the fabric I was contemplating for this Meringue Skirt. Boy am I glad I went ahead and used the Anna Maria Horner velveteen. Thanks for the encouragement, Judith. I have to admit, I adore this fabric. It is such a gorgeous, bold print and I'm glad I stepped out of my comfort zone to use such a statement fabric. I cut the front and back pattern pieces using the flat method, so I could line them up to have identical prints coming and going. The velveteen was very easy to sew. But I did take extra precautions when pressing so as to not crush the pile of the velveteen and so imprints from the seams would not show through on the right side of the fabric. The pattern instructions called for the waist and hem facing pieces to be cut using the same fashion fabric. Because the velveteen fabric has just a little bulk to it, I decided to use poly lining fabric for the facing pieces. It worked out great because those areas are not bulky at all and the skirt lays nice and flat around the waist and tummy area. I can't wait to sew up the jacket so I can wear my new outfit. If you've not tried any of the Colette sewing patterns yet, I encourage you to give them a try. The instructions are very well written and the sizing is pretty much the same as RTW. Wow, gorgeous fabric! This is a perfect way to showcase the fabric. I'm with Judith, jealous of the snow, missing it so much this year! Thanks, Andrea. 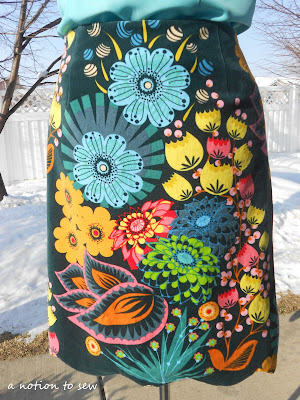 Anna Maria Horner does design some fabulous fabric. I would send you all the snow you could stand if it wouldn't melt in the mail. :) I'm not a cold weather kinda gal. Stunning!! That fabric is really something else. I don't think I'll be able to get it out of my head when I think to myself that I really prefer solids b/c then I'd miss out on something beautiful like this!